The Stewart 2 lounge and the Stewart Pit. 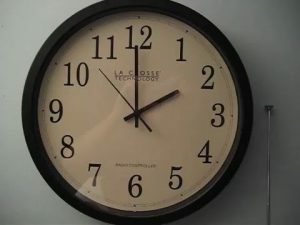 Our decision to end 24/7 in the library was based on usage data (only a very small number of students used the library past 2 am), the importance of getting sleep especially during stressful times (and the worry we had that by being open 24/7 we were tacitly encouraging students to stay up all night), and by budget pressures. Our decision was informed both by a student survey that we conducted in the spring, and with extensive conversations with the SGA. This entry was posted in LIS Staff Interest on November 27, 2018 by Michael Roy. I’m pleased to announce that the Lever Press has launched, and that Middlebury along with nearly 40 of our peers is supporting this effort as a charter member. You can read the press release on the Oberlin Group website, coverage of the announcement from Inside Higher Ed, and Barbara Fister’s reflection on the process and what this means for the future of scholarly communication. Twitter folks can track progress by following @Lever_Press . I am on the inaugural oversight committee, so I can also answer any questions that might arise. This entry was posted in LIS Staff Interest on January 15, 2016 by Michael Roy. 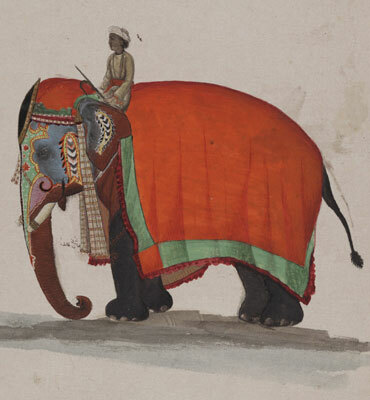 We’ve published the Library Update that covers the period from July 2014 to October 2014. It’s a fairly long read (12 pages single spaced) that documents both recent accomplishments and upcoming plans. Please let me know if you have any questions about any of the materials within. This entry was posted in Library News on November 21, 2014 by Michael Roy. We’ve posted the March 2014 Update from LIS. As has become our custom, we write this update three times a year to provide ourselves and rest of the community with a review of recent accomplishments, and more importantly, a roadmap for what to expect in the next three to six months. In addition, we make a nod to what we see as future issues and challenges further down the road. We continued to co-sponsor with CTLR the Academic Roundtable to encourage cross-campus conversation on important topics having to do with pedagogy, scholarly inquiry, and student learning. We also continued our planning for the digital liberal arts initiative. In Special Collections, we supported students and faculty during Winter Term including A People’s History of Middlebury and Field House Museum, Adventure Writing, Space and Place in the Graphic Novel, and Matt Longman’s seminar on higher education. We made more progress in building out our new videoconferencing infrastructure and upgraded a number of classroom. We continued to encourage our community to use Web Help Desk to request service from us. We created a new guide to training options that include both on-line, off-site, and on campus options. As part of the broader faculty governance conversations taking place on campus, we in turn are thinking about a wide range of governance questions. How do we ensure appropriate consultation with our students, faculty, and staff to ensure that our planning and prioritization is aligned with the needs of the community that we serve? We are hiring! We are currently running searches for a director of academic technology, a senior systems administrator, a head of collections, a media services specialist, and a network security analyst. We are discussing the technical and policy implications of converting our google apps from a pilot to a full-supported production system. We will also be discussing the process for evaluating new options for our email/calendaring system, and updating our analysis of the privacy and security implications of moving certain services to the cloud. We are busy planning for the move of the CSNS and Security work groups to Exchange Street, the move of the Enterprise Applications area to Painter House, and the re-use of space within the Davis Family Library to support the digital liberal arts initiative. We are planning an upgrade to the latest version of Microsoft Exchange. We’ll be rolling out a Network Access Control system that will allow us to more carefully control which devices can join our network. We’ll be reconfiguring the wireless network to make it simpler and more secure. As part of that, we’ll be putting in place a guest registration system to allow for those who only need to use it on a temporary basis. We will be working closely with many offices across campus to develop a multi-year plan for Nolij, the document imaging system that allows for offices to automate many of their paper-based processes. We’ll be upgrading Drupal, the software that powers our website to the latest version. We’re also working with the Office of Communications on rolling out a new design for the homepage and some of the key pages that are linked to from the home page. We will have an external security review of our systems as part of a consortial effort to improve our security stance. We will continue our efforts to study trends in the ways our public computer labs are used to help us plan for the future of providing computing resources to our students. We will start a pilot project where you can check out a bicycle from the circulation desk. We’re writing a Request for Proposal as part of our investigation into a new campus phone system. While we pursue all of this, we will of course keep doing all of our regular stuff: prepping for Language Schools, upgrading classroom and lab technology, adding more wireless access points, updating various systems, teaching information literacy courses, buying and cataloging library materials, and distributing new computers. One goal that we are very keen to pursue is to invent a fool-proof, indestructible stapler that no one can steal. If you have questions, comments, or suggestions on any of this, please feel free to contact me (Mike Roy, mdroy@middlebury.edu) or do so on-line at http://sites.middlebury.edu/lis/2014/03/27/march-lis-update/ . This entry was posted in LIS Staff Interest, lisblog, Post for MiddNotes and tagged priorities on March 27, 2014 by Michael Roy. 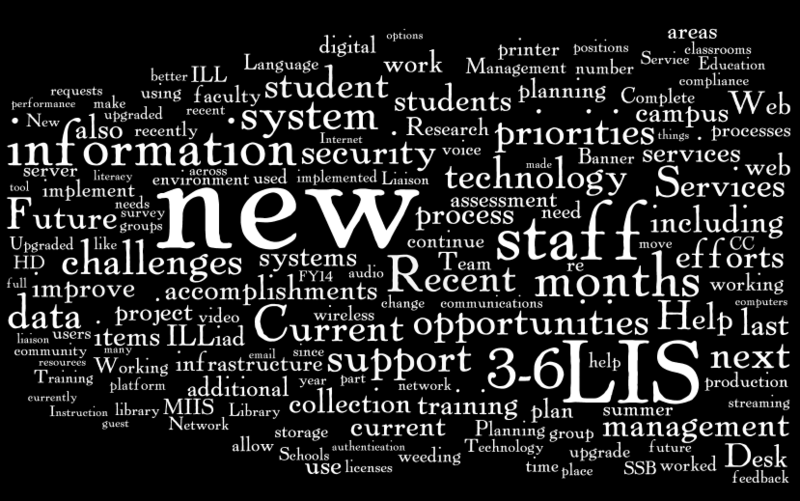 The LIS-Update-Fall-2013 from LIS is now available for your reading pleasure. This update from LIS covers work accomplished this summer and early fall, and projects out into work we will be doing in the later fall and early winter. For those not familiar with this report, it is designed both to capture the contributions that LIS has made in its efforts to support the information and technology needs of the College, and also to ensure that those who work within LIS and those who work closely with LIS are aware of current priorities and initiatives. Because of its goal to provide useful, detailed information for those of us deeply involved in this work, it is a long and somewhat technical document. We have been working closely with our colleagues at MIIS and with the new DC office to establish a new videconferencing system that significantly improves the quality and reliability of this service. We’ve installed a new system called web help desk that provides our users with the ability to create and track their own tickets, makes the assignment of tickets to workgroups far more efficient, and provides easy access to solutions to common problems. We migrated the last reports from our AS400 data system (the system that Banner replaced) and shut down that system forever. In response to the growth in demand for ubiquitous and robust wireless services across campus, we added access points to locations on campus where there was not adequate service. This fall we have been engaged in a planning effort with our colleagues from the Center for Teaching, Learning, and Research to establish new ways that we can work together to support faculty development in curricular technology, and to develop a plan for work in the digital liberal arts. This list is just a sample of our many recently completed projects, and our current priorities. I invite you to read through the complete list. If you have any questions about any of this, feel free to contact me. 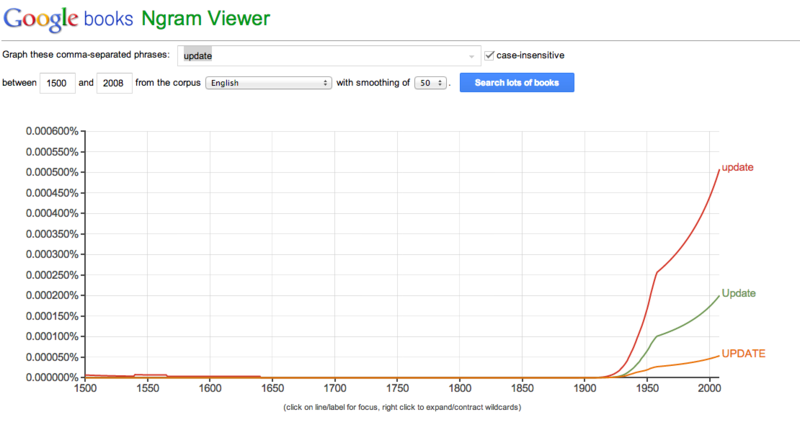 PS The graphic is from the Google Books Ngram Viewer, and shows the history of the use of the word Update over the last 500 years. This entry was posted in LIS Staff Interest, Middlebury Community Interest, Post for MiddNotes and tagged priorities on November 18, 2013 by Michael Roy. This entry was posted in LIS Staff Interest, Middlebury Community Interest, Post for MiddPoints and tagged priorities on August 8, 2013 by Michael Roy. I just posted the latest installment of the Quarterly Update from LIS. This installment covers activity from December 2012 through March 2013, and describes recent accomplishments, our current priorities (for the next 3-6 months) and longer range opportunities and challenges that we are preparing for. The 14 workgroups and teams that comprise LIS each contributed on average a little more than five items in each of the three categories. This adds up to a total of 233 items, broken down into 72 items recently accomplished, 95 items that are current priorities, and 66 items in the future-oriented category. As always, we hope that this report provides useful insight into the work that we are engaged in. We welcome feedback on any and all items included in this report. As I read through this, I think of the LIS mission statement “We bring knowledge to you. We help you explore, use, and contribute to it as you engage the world”, and how the many, many activities we are engaged in are all part of our overall effort to evolve our resources and services to adapt to a changing information and technology environment, an evolving curriculum, and a community with an increasing appetite for all things digital. I am also struck by how these seemingly disparate activities all do in fact connect with one another through our mission, and through our mission to the broader mission of the College. This entry was posted in LIS Staff Interest, Middlebury Community Interest, Post for MiddNotes and tagged priorities on April 3, 2013 by Michael Roy.